Published Apr 21, 2014 by Cisco Press. Part of the LiveLessons series. 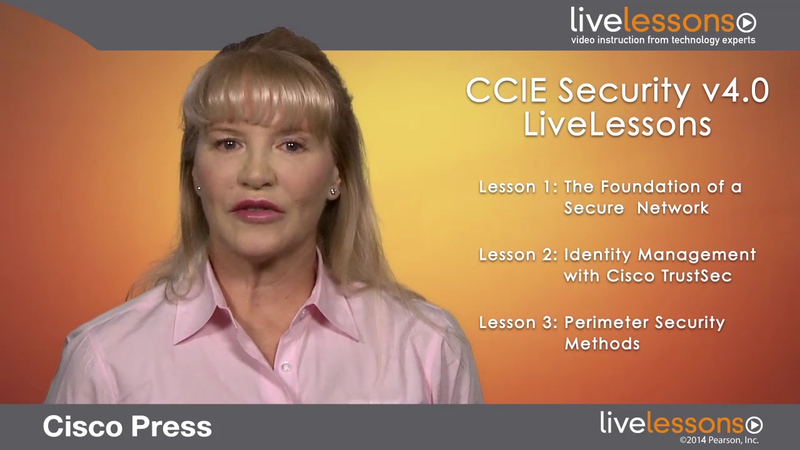 CCIE Security v4.0 LiveLessons is a practical video tutorial for CCIE Security Certification mapping to both written and lab exam topics with concepts and solutions. Each session represents a major domain of security concepts and solutions implemented using Cisco security products and solutions. This video tutorial covers topics relevant to the new exam version 4.0 so it is updated to reflect major industry trends and the latest Cisco security offerings. It is designed to accompany the practical lab guide and also presents information relevant to the CCIE Security V4.0 Written Exam. Security is not just an overlay to a network topology. Without a proper understanding of the underlying network infrastructure and the goals of the entity being secured, choosing and implementing appropriate security features correctly can be a problem. This lesson covers building a network design in terms of technical components and customer objectives, and then outlines several security tools, features and resources that may be applied to the design to secure it against common attack classes. The goal of this lesson is to reinforce the importance of understanding the problem to be solved before configuring and tuning security features. Natalie Timms is the former product manager with the CCIE program at Cisco Systems, Inc., where she managed exam content for the CCIE Security track and introduced Version 4.0. She has more than 15 years of Cisco networking experience working in various roles: field sales specialist, product manager and software engineer. Natalie has contributed at the IETF standards level and been involved with various certification programs for Cisco VPN based products, specifically ICSA and FIPS. Natalie is a a three time CiscoLive Distinguished Speaker award winner, holder of several security related US patents, and am a former network training developer and instructor (Wellfleet Communications). Her educational background includes a BSc in Computing Science and Statistics from Macquarie University in Sydney, Australia. The target audiences for this video course are prospective candidates for CCIE or those professionals seeking a definitive reference guide for security information, in particular how it pertains to Cisco products and solutions. There is also a secondary audience that includes those currently evaluating the requirements in terms of content and complexity, needed to attempt CCIE security certification. This video product is part of the Cisco Press LiveLesson Series. The video products in this series present expert training from industry-leading instructors and technologists. This dynamic learning environment combines animations, screencasts, and audio instruction to help users bridge the gap between conceptual knowledge and hands on application. This lesson covers Identity Management using Cisco TrustSec (CTS). CTS leverages Identity Based Networking Services (IBNS) by combining legacy AAA with newer technologies like 802.1X, 802.1AE and Security Group Tagging. SGA uses SGTs for classification, propagation and enforcement of security policy amongst authenticated devices in a CTS domain. In this lesson a working CTS solution is presented including configuration and verification. Using firewalls to apply stateful perimeter security is a fundamental part of most network designs. This lesson covers the evolution of identity-based firewalling on the Cisco ASA from Cut-Through Proxy to Identity Firewall to integration with Cisco TrustSec. Cisco IOS Zone-Based Firewall is then reviewed including a discussion of the Self-Zone, applying firewall services at various layers, and integration with Cisco TrustSec. This lesson also presents working configurations for both firewalls. This lesson looks at configuring appliances that perform specific filtering and protection services. This is a review of some of the functions and capabilities of the Cisco Web Services Appliance (WSA) , including WCCP for web traffic redirection to the WSA integrated with user authentication to provide access policies through the WSA on a peruser basis. Deployment models for the Cisco IPS sensor as well as enabling custom signatures and event-action-overrides will also be covered. Working configurations for both appliances are presented. This lesson covers securing both wired and wireless access to the network. A review ofFlexVPN solutions for remote access using IKEv2 and virtual interfaces is presented with configurations and verifications for wired access. Securing wireless access using Cisco WLCs and Cisco Access-Points may be achieved by implementing dynamic interfaces that provide security by segmenting traffic and applying different security methods per interface. This lesson also reviews authenticating APs that are to be provisioned and managed by the WLC using 802.1X and touches on some well know wireless security threats and mitigation methods. Hardening protects a device from various attack classes that may impact its performance level of service. Another important aspect of hardening is establishing secure access and audit methods to reduce the chance of system compromise whether malicious or inadvertent. This lesson identifies core hardening concepts that must be implemented to protect the underlying network infrastructure and ensure a predictable level of service. In this lesson we review the ways in which Cisco devices are configured to identify both known and unknown attacks and then cover device-specific mitigation techniques. This lesson also reviews the order of operation on the Cisco ASA, and understanding feature configuration changes that will require a migration strategy when moving from pre to post 8.3 software versions.